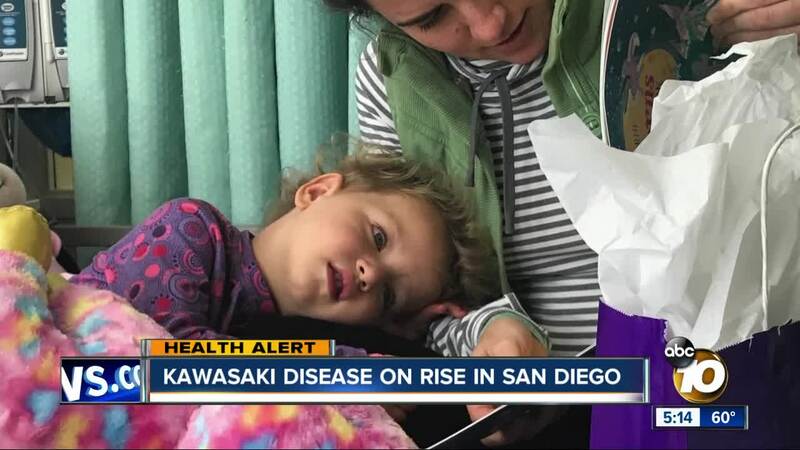 SAN DIEGO (KGTV) — San Diego parents are being warned about an increase in Kawasaki disease, a heart illness which sees an uptick in cases during wet, cool weather. 16 local children have been diagnosed with the disease since the start of 2019, according to county officials. Symptoms include fever, rash, swelling of the hands and feet, bloodshot eyes, swollen lymph glands in the neck, and red mouth, lips and throat. Peeling of the fingers and toes occurs in many patients after the fever has subsided, County News Center reported. The County of San Diego Health and Human Services Agency issued a health advisory to area doctors Thursday. Experts are unsure of the cause of Kawasaki disease. Researchers at UC San Diego School of Medicine, Scripps Institution of Oceanography and international collaborators found a link between the climate and an increase in cases. Genetics also contribute to cases, with Asian/Pacific Islanders having an increased risk.